Steve Metcalf's dramatic injury-time equaliser saw Horsham earn a deserved share of the spoils in a intense Bostik League South East play-off encounter at a sodden Culver Road. A full-throttle evening looked to have been decided by The Arrows' Jordy Mongoy's second-half strike close to the hour-mark, before the late drama in the fourth minute of added time. 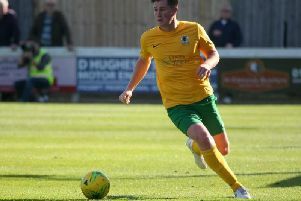 It left things as they were in the play-off race, Hastings sitting third on 46 points, two behind second-placed Ashford United and Horsham fourth on 42 points, but just three ahead of fifth-placed Haywards Heath. Di Paola praised 'brilliant' effort against the odds with his side not having played or trained in ten days and with four key players out injured, they had to throw in Will Miles for his debut having just met his team-mates in the changing room. The Hornets boss said: "We have to take into account we were a bit leggy, we haven't done anything for ten days as we weren't able to train. Obviously, there was no Charlie Harris, no Lewis Hyde, no Dylan Merchant and Dean Lovegrove failed a fitness test, so we had just two on the bench. "We were playing one of the better sides in our league, so I think we did really well. It was a pretty even game. Second half we trailed off a little bit, but once we went behind, I think we were the dominant force. "Again though, it was not taking our chances. Rob's (O'Toole's) chance in the second half I would expect him to score and we had two good chances in the first half. Their goalkeeper made two good saves, I know Pells (Josh Pelling) had some work to do as well. "I think a draw was about fair, it was a really good game of football and I enjoyed watching it. I was frustrated with the time wasting again - another token 89th-minute booking for a player (was the only action taken). "They are a good side and weren't far off full strength - they were missing Sam Cruttwell. Will Miles has played one game in eight or nine weeks so was scrambling a little bit. Putting Kirky (Scott Kirkwood) in there, it was he only appearance of the whole season, and Tyrell (Richardson-Brown) has not played a lot recently, he's been on the bench. "I really can't complain with the efforts, I think we did well. I think it was a good performance, they have such good character these boys, they battle and fight. "They are a favourite and especially on a good surface they are good going forward. At any level, pace is a threat. Their number nine won't be playing at this level for very long, he is a real standout player in this league. "They have Dixon and Sam Adams midfield, who are very experienced and high-quality players. Our boys did brilliant." The equaliser prompted wild celebrations on the pitch and the sidelines, but Di Paola revealed he wasn't celebrating on the sidelines. He added: "I didn't celebrate at all to be honest. My first thought at that stage was that the referee might play another five minutes added time. Last year I moaned about it down there when we were 2-0 down and they were time wasting. "We got it back to 3-2 in normal time and in the time they time wasted, they got their equaliser. I could see something like that happen again. "I was just thinking at that stage, let's come away with something and we can go home happy."